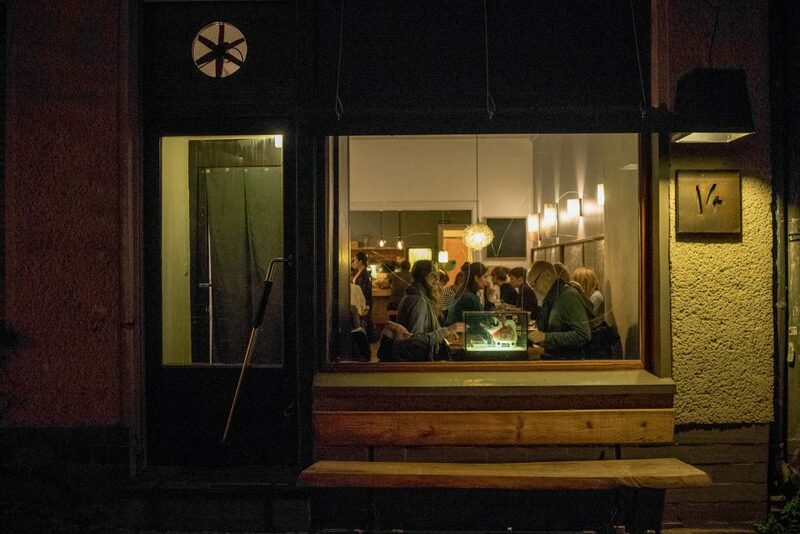 Omoni is a pretty hidden restaurant in northern Prenzlauer Berg with a Japanese-Korean fusion menu. 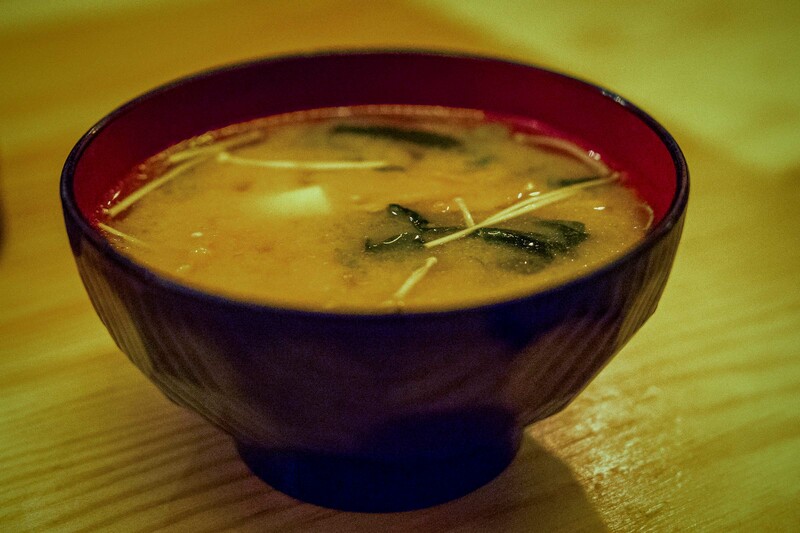 Some of the best sushi I’ve tasted in Berlin along with a tasty Bibimbap make Omoni a very interesting food destination. 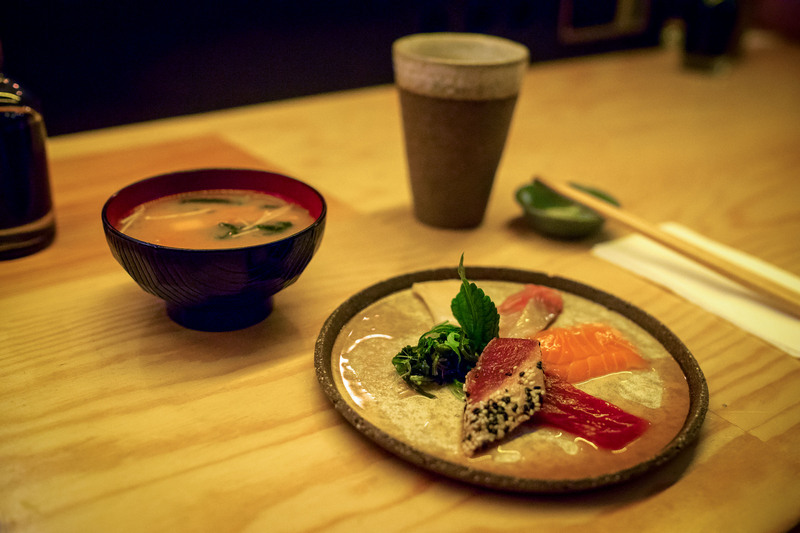 Omoni is by no means a new addition to the Berlin food scene, the owners used to run the Sushi-Ky in Pberg and relocated to the quiet spot in Kopenhagener Str. a couple of years ago. This area pretty much marks the outer limit of “good-restaurant-land” and it’s not very easy to find Omoni. There is no sign showing you the entrance, but once you’ve actually found the place you’re in for a treat. Stretching into the back where the Sushi master works his magic in a tank top (always, no exceptions), the place fits around 40 people and most days every seat is full. All because Mr. Tank Top is rolling up some seriously good sushi behind his bar. The venue is nice to very nice, cosy as hell with rugs on the walls and a wooden bar in the back. The design and layout does really work well with the food concept and somebody put some thought into this place. 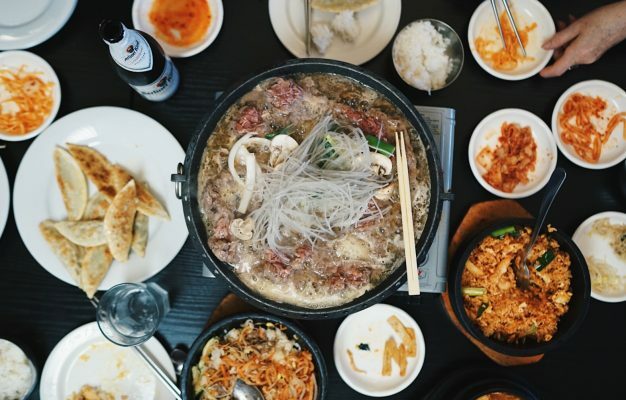 Omoni has a pretty unique menu setup, the focus lies on sushi variations but there are some interesting items on the menu, especially a proper, Korean Bibimbap. Kind of weird, but hey, why the hell not. 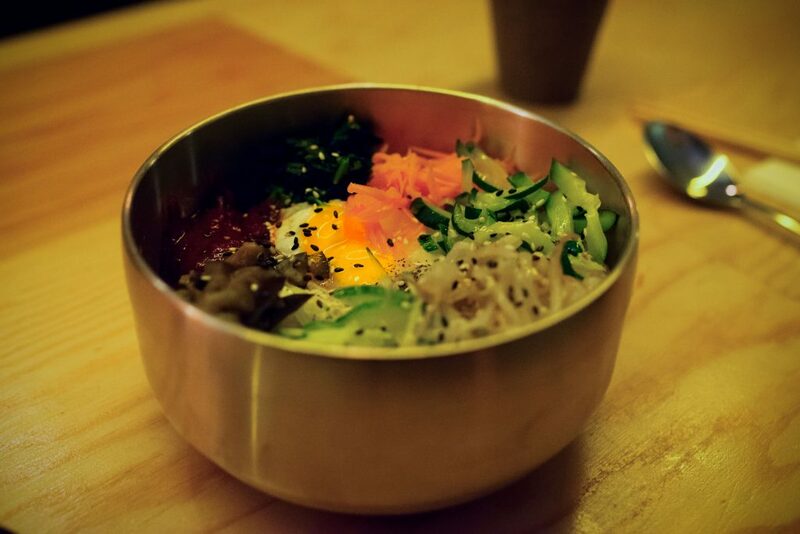 It’s also a pretty good Bibimbap, with everything done right, served in proper stone bowl with crusty rice. 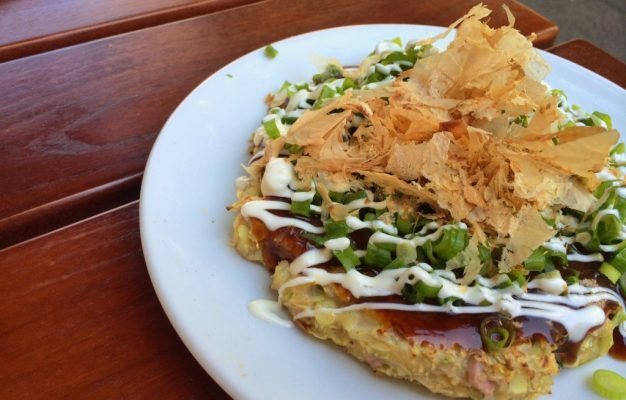 Definitely not the first dish you should try at Omoni though, because this place has some seriously good sushi and sashimi. Not because the owners and the staff seem to be Japanese, but still. 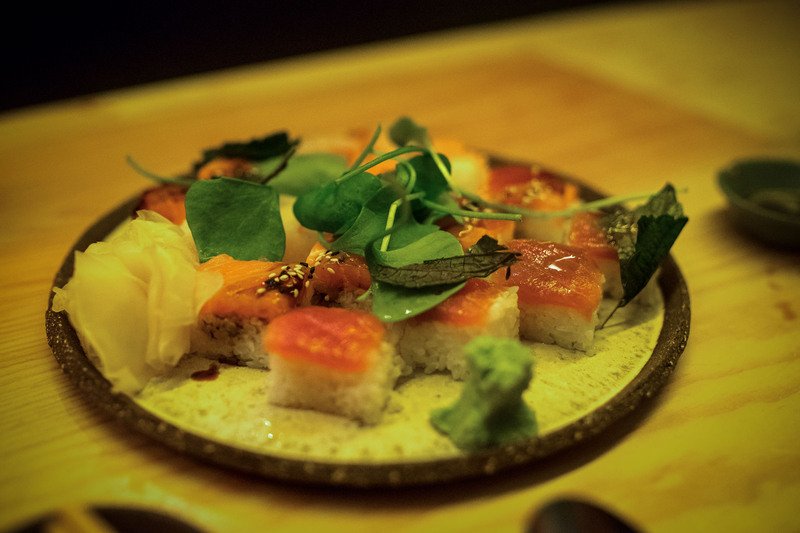 We’re talking classic Japanese sushi along with some very interesting varieties like the Kopenhagener Roll, a big roll with okura, asparagus, avocado and topped of with salmon slices and black bean sauce. Or the Big Futo Tempura roll with rolled up tempura. Very tasty! Omoni is worth a journey even if you don’t live in Prenzlauer Berg. One of my absolute favourites is the fish carpaccio starter which they call the ‘Carpaccio Mix”, a plate of sliced sashimi that seeks it’s counterpart in Berlin. 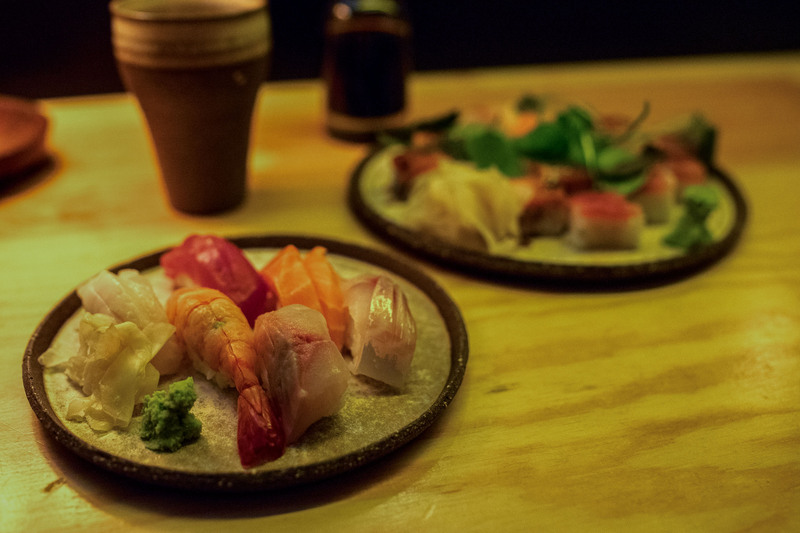 Outstandingly well sourced fish is a reoccurring theme of the sushi at Omoni and I would go as far as saying that Omoni is one of the best sushi restaurants in Berlin along with Sasaya, Gingi and Ishin. Actually better than Gingi and Ishin. 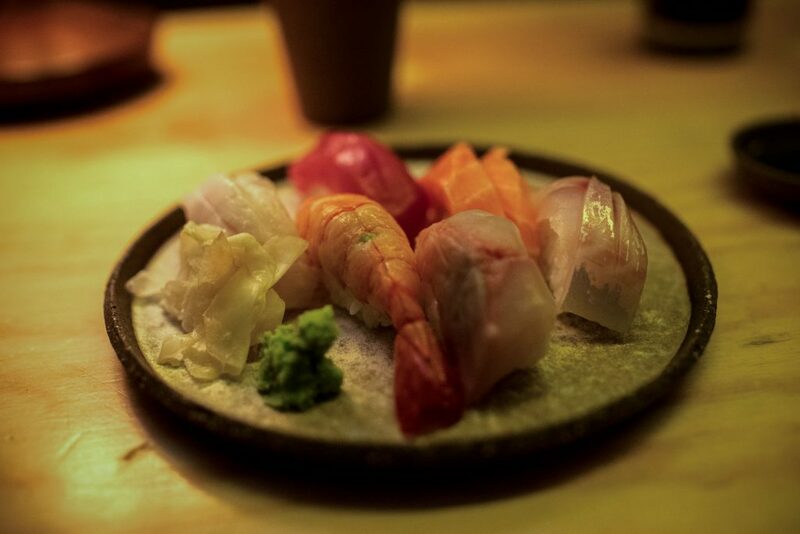 It’s the kind of sushi I don’t get tired of which means the chef devotes his life to sourcing and ageing his fish. Same thing goes for the rice, it’s of very high quality and cooked and seasoned properly which is rare in Berlin. Omoni is a lovely restaurant and a place I try to come back to as often as possible. Lately it’s become increasingly hard to get a table on short notice and it makes sense, this place is worth a journey even if you don’t live in Pberg. Service is usually decent to great, really depends on the waiter. Don’t miss their amazing tea selection, some great varieties on the menu here. And they have Lammsbräu Bio Zisch, one of my favourite German beers! Enough said. Go eat sushi at Omoni.